This exotic blend combines herbaceous Raw Green Rooibos and fragrant, luscious mango finished with a little kick of chili. This sweet and spicy tea is low in tannins, will cool the body and wake up the senses – hot or iced. I really like this tisane, and I’m very happy to see that more tea companies are exploring “raw” or green rooibos. I personally prefer green rooibos to the oxidized red rooibos. The green tends to have a crisper, fruitier profile vs. the woody, somewhat nutty flavor of the red. 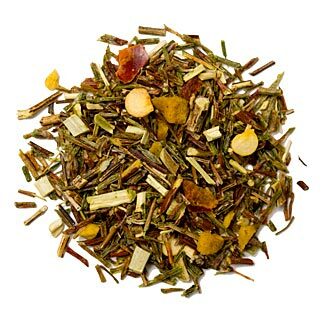 And that crisp, bubbly flavor of the green rooibos melds deliciously with the flavors of mango and chili in this blend. The mango flavor is beautifully represented here. It is sweet, but not too sweet – thanks to the addition of the chili. I think that a little more chili flavor would be nice here, but as it is, I do like the way the chili cuts through some of that sweet mango taste. The chili also comes through a little bit at the tail of the sip, giving mere hints of a tingly spice. Despite the name of this tea, it is NOT a spicy tea. It is gently spiced, with just enough mild warmth to make it interesting without an overpowering sense of heat. For those who have a taste for the spicier things in life, you might find this blend a little disappointing. I happen to be one who has a flair for spicy foods and beverages… and while I would like a little more chili taste here, I still find this to be a very enjoyable cup. It is PERFECT for a late-night tisane, and also makes for a refreshingly different iced tea!